Imagine if you would, a beautiful spring Monday morning. Accompanying a wonderful classical melody is a breeze that wafts lightly through the window across my face as I stretch and breathe deeply. I am awake now, ready to start another day. The clock radio is playing my favorite classical station. As the concerto ends, I reach over and gently press the off button. I then get up and do the usual things. Then I kiss my dearest and I'm off to work. Today is going to be a great day. There's even less traffic. On with the car radio for more classical tunes. "It's now 8:35 on a beautiful Monday morning and for those of you who forgot to move your clocks forward, it's 7:35..."
Even the $%&*#@ car clock was wrong. Why can't these clocks set themselves!?! Anybody care to speculate what year this is? NO! It's not the 1960s. It is past Y2K and we as dim bulbs still have to readjust our clocks...twice a year! Well...not anymore...for me, that is. My new car has a radio that automatically sets the clock to the GPS; my cell phone, the phone company; the computer, the Internet; and now my house clocks, WWVB. It's a radio station, but I don't listen to it. My clocks do. 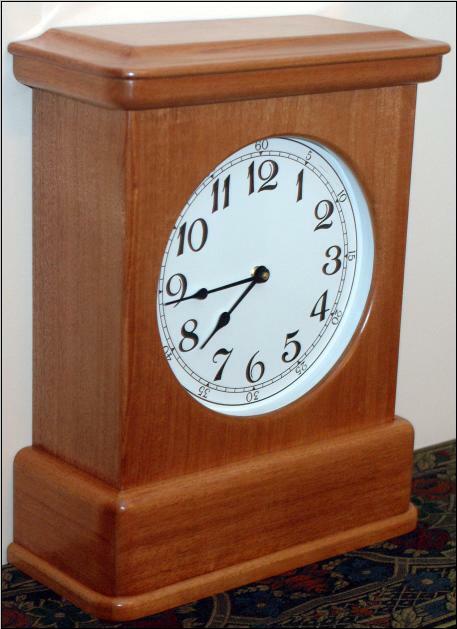 You can click the WWVB link to learn how specially made clocks can do this. Wedding Anniversary clock I made for my wife. What movement I use in the clocks I build.